In Edinburgh, this is the final hectic weekend of the annual Festival Fringe. There have been 3,400 shows - some of which have delighted critics and some which definitely did not. In comedy, a rich theme has been the state of America and of the US presidency. But is satirising President Trump the definition of pointlessness? At the start of last year, comedian Simon Jay needed to decide on the show he'd work on for the 2016 Edinburgh Festival Fringe. "This was 20 months ago so Donald Trump wasn't even Republican nominee - but I sensed comedy in him so I decided to take a punt and go for a Trump show," he says. "But I think even last August the Edinburgh audience was mainly seeing Trump as a bit of a no-hoper. A year later I'm back with a show about a president." 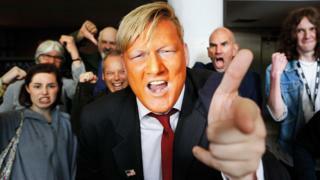 It's probably safe to say few of the comedians satirising President Trump at Edinburgh this year have been fans of his style or his politics. But they accept that the first months of his presidency have provided huge amounts of material. In Trumpageddon, a deeply orange Jay invites his audience to a rally. The president deals peremptorily with questions then - as Jay admits - "tends to get a bit handsy" with women in the audience. "Standing on stage, I can see some people get really frightened by him. I've watched lots of his rallies online and they're big showman experiences. "They're loud and silly and bizarre and in some ways it's like a stand-up experience already. In the 1970s, Trump could have been the American Bernard Manning." Jay says the impersonation aspect is important but it's only part of the show. "I use my real hair and a lot of make-up. There are some obvious things like wearing a blue suit and the strange o-shapes he makes with his fingers. "When the audience submit questions they can be silly and crude - but Americans in particular also ask intelligent questions about energy policy or big business. "So I need to know enough about Trump to give informed answers, alongside all the jokes. The audience knows I'm the puppeteer but they want to hear from the real Donald Trump too." The other person in Edinburgh who's playing President Trump for an entire show is Cambridge student Jack Bolton. Trump'd is a comedy musical set in a future America where Arnold Schwarzenegger has become Vice-President. "I think President Trump is the joke that never goes stale," Bolton says. "Our story isn't dealing directly with events of 2017 but every week there are developments keeping him in the news: people want to hear about him. So he's box-office." Adam Woolf is one of the show's writers. "We're not trying to change people's view of him," he says. "In the States people have already formed their opinions of him and that's probably largely true in Edinburgh too. Basically we're just making fun of him, we're not going to bring him down." Jack Bolton spends part of each day in costume distributing flyers for the show to tourists on Edinburgh's Royal Mile. "I do sometimes encounter very pro-Trump Republicans and, to be fair, most take my impersonation in their stride," Bolton says. "I think even his supporters recognise he has flaws in his personality." "I admit I enjoyed seeing Simon Jay as Trump in our rival show in Edinburgh. It's very different because we have songs and dances but I think Trump lends himself to improv too. He's a rich source of comedy." Unlike Jay, Jack Bolton wears a blond wig in the role. He says Alec Baldwin on Saturday Night Live has been a big influence on his portrayal. Woolf says, as a writer, it's the psychological traits he tried to capture. "Trump always has to portray himself as a winner and repeatedly points out that he's a winner - so you build that into the script," Woolf explains. "He is capable of totally dismissing the facts of any criticism made of him, which even now surprises me." Already well-known from appearances on mainstream TV, Matt Forde's show in Edinburgh is called A Show Hastily Rewritten in Light of Recent Events - Again. It's not all about Trump but, he says: "It's an hour of stand-up about the mad chaos which has descended on the world - so there's a lot of him." "I find Trump in some ways a despicable individual but you have to admit he's exceptionally entertaining. "So you can have fun with the voice and physically what he does with his shoulders and his mouth. But there's a twin-track because you're trying to expose his politics too." "Another impersonation who's been a winner for me is Boris Johnson and there's a certain parallel between them. They both have constructed personas which are designed to distract. "Both men have inherently comedic linguistic tics and bits of body language which are in part deliberate. But they're very powerful individuals - you have to extract the comedy they offer but also keep them under scrutiny." Forde adds: "For someone like me in Edinburgh there's a sweet spot where you say something that makes the audience laugh about a politician but it's also a point well-made with some truth behind it." Image caption Geoff Norcott styles himself as "the UK's only declared Conservative comedian"
At 40, Geoff Norcott is creating a niche for himself as Britain's best-known right-wing comic. He acknowledges the label is a simplification, "but it creates a very useful dynamic with the audience". His show at Edinburgh is called Right Leaning But Well Meaning. So will Geoff be the stand-up who stands up for Trump? "Politics in Britain and in America are very different. I'm seen here as a Tory but in America I think I could be on one wing of the Democrats," he says. "If I do start building more Trump into my act, probably it will be talking about the media's demonization of people who voted for him. "I don't think I would do material expressly defending Donald Trump but it annoys me when voters are seen as having had malevolence in their heart. Poor Americans in particular look at Trump and genuinely see something that appeals to them. Norcott continues: "I'm a satirist and satire has to be directed above all at people who wield power and influence - which can be different from being in political power. It would be interesting to find comedy that's explicitly pro-Trump and I imagine in America you will find it. There are blue-collar comics there who will have very different opinions from most people performing at Edinburgh. "There's comedy in the high-minded elitism of those who are so quick to criticise Trump-voters. As a performer, I have to watch Trump carefully because he's the US president and has huge power. "But I also keep an eye on the cultural overlords who don't approve of him and are continually telling me to think the same things. Satire isn't all one way." Are we living in a golden age of satire?